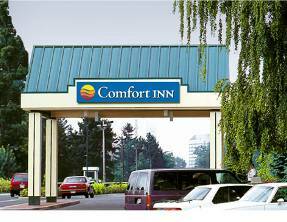 Comfort Inn Clifton Hill is located on Clifton Hill – the Street of Fun in Niagara Falls & the heart of Niagara Fall’s entertainment, and dining district in Canada. This Niagara Falls hotel is situated just one block to the Falls and within walking distance to many attractions in Niagara. This CAA/AAA 3-diamond, 182 guestrioom, hotel offers wonderful amenites, on-site attractions, clean accommodations, great dining options, and a wide range of shopping options, the Comfort Inn Clifton Hill is a great hotel for any getaway. The Comfort Inn Clifton Hill offers the perfect vacation destination for you next Niagara Falls getaway. Conveniently located in the heart of the Tourist District, this Niagara Falls hotel offers all the great attractions and the location that you expect in Niagara Falls. The hotel is near to spectacular dining options including Kelsey’s Restaurant, Boston Pizza, Hard Rock Cafe and the Rainforest Cafe. It is also adjacent to Casino Niagara, Niagara’s first Casino, and Rumours Night Club, Club Mardi Gras and Hard Rock Club.